Built on the site of the old Bermondsey Abbey, the Bermondsey Market was a thing of wonder, sprawling into the backstreets and surrounding warehouses. You have to get up very early on a Friday morning to go there, and even many Londoners have no idea it’s there. Situated on the other side of Tower Bridge, it became a shadow of itself in 2006 thanks to the rampant property development of all those lovely decrepit warehouses. It used to be called the New Caledonian Market, having been relocated from North London (the actress Valerie Hobson opened it in 1949), but because it’s in Bermondsey Square people changed the name. Bermondsey is a ‘market ouvert’, following an ancient law which was finally repealed just a few years ago. Under this law, if you sold an item between sunrise and sunset then its provenance couldn’t be questioned, so stolen goods could be traded without any legal comeback on the buyer. It’s amazing how many Londoners don’t know it exists. Tourists are often better informed than we are. The old law meant you used to get a lot of stolen goods turning up. But the market actually opens before dawn, so you need a torch to check out the goods. 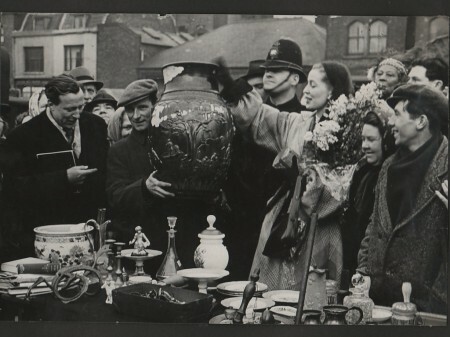 This is where it gets tricky, because although there are many cheap items you could also pay a fortune for a dud, which is why Bermondsey was always something of an experts’ market. Like everything else in London its history confuses because the Caledonian market was primarily a cattle market but spread to the sale of other items. Meanwhile up the road, the Old Vic, a theatre not originally named after Victoria but after the King of Belgium, changed to meaning Queen Victoria before spawning the Young Vic, not named after a queen but for young people’s plays, which it sometimes still produces. Nearby used to be the home of the Union Jack Club, a soldiers’ club presided over by a statue of Britannia and started to commemorate those who fell in the South African war. Although the club still exists it’s now in a modern building and Britannia has vanished. My point in all of this is that while everything has moved around or completely changed out of recognition, there are also oddities still about, hiding in plain sight. A market built on former swamplands, Lower Marsh Market, is tucked to one side of the Old Vic, there are sharks on Lutyens’ dolphin fountains in Trafalgar Square, there’s an iron cape hook for a copper off Leicester Square, there are chimneys that masquerade as lamps, doors, alleys and there are tunnels with hidden theatres. And speaking of Trafalgar Square, many people know it’s the site of London’s tiniest police box, but did you ever notice what’s on top of it? A lamp from Nelson’s flagship The Victory. To confuse matters further, tour guides don’t always tell the truth. Some of Arthur Bryant’s tour guide scripts are included in the new novel, ‘The Lonely Hour’, out tomorrow. Hi Chris,I live in Wimbledon which has changed a lot in the last 30 years.See you tomorrow. By the way, I’ve never remembered in time to try it but have been told that eggs will stand on their end during the equinox. That’s today. Don’t know whether right out of the ‘frig will work. Not right out of the frig and not later when it warmed up somewhat. I’ll try again next year and at the autumn equinox as well. I’ll be getting my copy today and going to the talk by Christopher. I am lucky. But,of course, I will be putting NO SPOILERS on here, you can be sure of that. P.S. How are you and Ken? I only found out recently (if its not an invented tourist guide type fact) that the height of Nelsons column reflected the height of the HMS Victory from base to just above the crows nest. Appropriate really that Nelson’s looking down toward the Mall with the replicas of all the ships in his fleet attached to the lamp posts there ..each ship being recreated. There are times you know that just just HAVE to spin a few few stories to the tourists its irresistible. I once told a bunch of older American tourists that the Royal yacht Brittania which was at the time anchored close to Tower Bridge for some naval type festival was in fact the Commisioners launch and that the Commisioner of the Met Police was also a honorary rear admiral who would pop out of his cabin (where he lived don’t you know) and inspect his Fleet of Thames division launches. This ceremony having taken place at exactly 1130 on every third Saturday in the month since the Met was founded. They loved it. Had to be done life would have been the poorer had I not …. I think that the little kiosk? booth? cubicle? 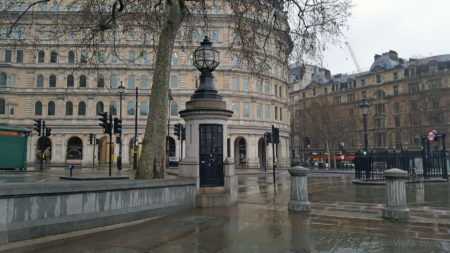 at the corner of Trafalgar Square was put there so that a Policeman could observe meetings and demonstrations in the square, and call Scotland Yard (Whitehall 1212) if it looked as if the situation was about to kick off. Rather sadly, the last time I looked inside, it was full of brooms and a couple of traffic cones. Jan, I have learned that interesting tales told to visitors are not ever to be trusted and never repeated unless verified by recognised sources. On the other hand, that is such a great tale that yes, you had to tell it. The Bermondsey Market brought to mind another ‘Fast Show’ character – Chris the Cockney (“I will nick anything – I’m a geezer, a bit ‘Whuu!,’ a bit ‘Whay! ‘ “)etc. One of his catchphrases was “It’s all pukka – it’s all nicked!” That would have been the perfect slogan for the market, prior to the law changing the ruling.